The opposite to dehumidifiers that take moisture out of the air, humidifiers put moisture back into the air. Not only do they offer great health benefits and help ward off colds and flu in the winter, but they also assist with retaining heat during winter, meaning less power usage! They are hugely popular and it’s easy to see why, and now that you know you have to have one, there is only one more thing to do - choose one! With so many brands out there, how do you choose? 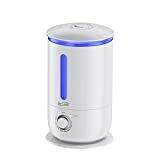 Our aim is to help consumers make smart decisions much easier, and therefore we have put together this full humidifier buying guide that will help you choose the perfect humidifier and have you and your family healthier in no time. Cool-Mist/Impeller Humidifiers: These humidifiers spin water droplets into the air using a spinning disk. Because they don’t require the water to boil, they are much more economical to run. Whole House Humidifiers: These are big units designed to humidify the whole house and work well in areas as large as 2,700 square feet. 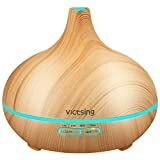 Ultrasonic Humidifiers: Using sound frequencies, these humidifiers produce a warm or cool mist that is absorbed immediately. Ultrasonic humidifiers are available with or without filters, depending on your preference and the water you will want to use. Without a fan, these units are quieter options, ideal for bedrooms, studies, and living rooms where quiet is needed. 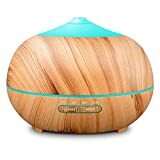 Warm-Mist Humidifiers: Warm-mist humidifiers boil water to form steam. Normally small enough to fit on a table or countertop, they are well priced units that are quiet to run. Because they raise the room temperature with their steam, they are great humidifiers for cooler climates and winter use. Vaporizing Humidifiers: These humidifiers, like warm-mist humidifiers, heat and boil water to create mist. Often used in conjunction with medication to prevent coughing, they are ideal for people looking for humidifiers for environmental and medicinal use. Evaporative Humidifiers: With the use of a fan, evaporative humidifiers distribute water that has been soaked into a wick. They can be very cost effective and their filters prevent any particles and minerals from being spread around your home. They are a popular consumer choice. 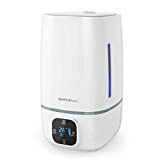 Portable/Tabletop Humidifier: These are the most portable and compact sized humidifiers and are the perfect size for small areas or a single room, or for pointing to a localized point (like your desk) where you are working. Console/Room Humidifiers: These are large enough to humidify a few rooms at once and are a great solution for more than one bedroom or smaller apartments, working well in areas up to 1,200 square feet. Design: Not only do humidifier owners value units that look good, but they also consider the build an important factor. 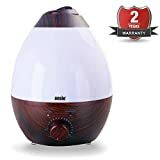 Humidifiers that have tanks that are easy to fill and maintain are rated much higher than those that don’t, as are portable humidifiers over bulky, larger units. 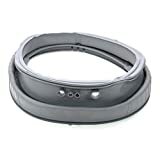 Buying a good quality brand with good solid reviews will ensure satisfaction. Maintenance: Units that are easier to clean are definite favorites and owners don’t mind a little weekly maintenance if it is quick and easy to do. Units with filters that don’t need month to month replacing result in lower maintenance costs and are also rated much higher by owners. Warm/Cool Mist: For warmer climates, owners like cool mist humidifiers that don’t change the temperature of the air, and in cooler areas, warm mist humidifiers add value by warming the air around them and reducing the need to use heating appliances. 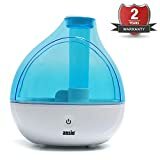 Choosing a mist temperature that suits your needs, health, and environment will make sure you don’t have buyer’s remorse. Operation Noise: Almost all satisfied humidifier owners note that their units operate quietly, whereas there is a lot of dissatisfaction with models that are noisy. If you need to use yours in an area of the home that demands more quiet, opt for a type known to operate quieter to eliminate frustration. When choosing between mist types, ask yourself how quiet you need it your humidifier to be and how easy you want the maintenance - and whether that’s more important than price. Let’s talk size! Where will your put your humidifier and what size area do you want it to operate in? For smaller areas, a portable tabletop unit is the most suited, for larger rooms or to humidify the entire house opt for a larger models. Also consider how long you want to be able to use it without refilling - larger models can last up to 24 hours without needing to be refilled, where small portable units may only last a couple of hours. An easy to detach water container or reservoir will make cleaning and refilling much easier. 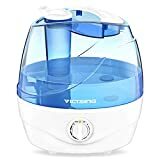 If your new humidifier doesn’t include a filter that is designed to kill bacteria before the vapor gets circulated, it is well worth buying separately to ensure the air you are breathing in is not only moist but healthy! An indicator light will warn you when your unit is running low on water and prevent it from running empty. An automatic shut off will turn off the unit when it is totally out of water. Tanks that are dishwasher safe take all the hassle out of cleaning. A unit with an adjustable humidistat will automatically detect humidity levels and shut off or switch on when needed. Digital display settings are easier to read than dials. Units with timers allow you to set the machine for a certain time of the day; ideal for people not home during the day. 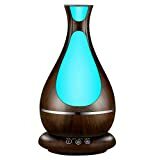 If you are buying a humidifier for medicinal reasons, look for one that includes a medicine cup so that you can easily disperse medicine into the air. 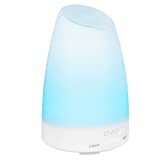 Crane: Crane US has put the fun into humidifiers, air purifiers, and space heating by manufacturing unique styles and designs aimed at consumers who want their products to look good and work well. Air-O-Swiss: With over 50 years of experience, Air-O-Swiss became available in the states in 2001 and has quickly become a brand associated with high performance humidification and purification. Honeywell: Honeywell’s aim is to bring quality products, value, and technology to consumers, and they are known for their good service and good quality home appliances that include heating, cooling, and humidification products. Vicks: Vicks has been in the health industry for over 100 years and is well known for its efforts to cure colds and flus! This makes them an ideal manufacture of humidifiers, and they provide customers with quality products.